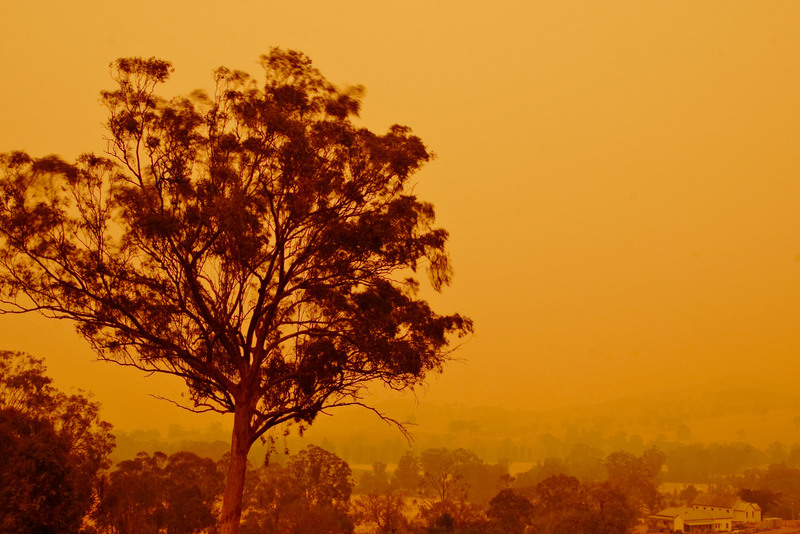 The bush fires ravaging Australia this summer could turn out to be the worst on record. Public reaction on both sides of the Tasman has been full of humanitarian concern for the victims. Meanwhile, our leaders plough on with policies which will spread more disasters like these globally – including here in Aotearoa. The fires have been sparked by record-breaking temperatures. “The current heatwave – in terms of its duration, its intensity and its extent – is unprecedented,” said David Jones from the Australian Bureau of Meteorology. Temperatures at Sydney’s Observatory Hill have hit 45.8 oC – shattering the 1939 record by half a degree. In the South Australian town of Oodnadatta, it has been so hot that petrol evaporated at the pump, making it impossible for people to refill their cars. Prime Minister Julia Gillard said she felt “overwhelmed by the bravery and stoicism that people are showing in such difficult circumstances” and promised disaster relief payments for the victims, even acknowledging that “as a result of climate change, we are going to see more extreme weather events”. But she added only, “We live in a country that is hot and dry… so we live with this risk”. There was no mention of climate policy. Under her government, Australia remains the highest per capita emitter of greenhouse gases in the world. The story of the fires does not just concern Australia, however. The disasters also came less than two months after our own prime minister, John Key, announced that New Zealand would be pulling out of the Kyoto Protocol on climate change from the end of 2012. The first two weeks of January also brought three extreme weather events to the West Coast, with deluges and thunderstorms pounding the region. The worst flooding in 30 years cut State Highway 6, phone and internet cables, isolating towns surrounding Fox and Franz Joseph glaciers. This summer’s events are confirming the accuracy of climate modelling by the National Institute of Water and Atmospheric Research (NIWA). As early as 2004, NIWA published predictions that climate change would create “increased risk of very high temperatures” and weather that’s “wetter in the west and drier in the east”. Under current policy settings, none of this is set to change. The political leadership of the climate debate was captured in the 1990s by the Green Party, through their far-sighted, principled positions. From 2006, however, the Greens have moved to embrace mainstream, market-based “solutions” to climate change, beginning with the release of their ‘Turn Down The Heat’ document. As then co-leader Jeanette Fitzsimons explained, almost apologetically, “Our policy since 1993 was a carbon charge. However from the end of 2005 it was clear that neither Labour nor National would contemplate a carbon charge. That led us to put out our alternative”. Their 2007 Climate Change Policy announced, “we will work to improve the Emissions Trading Scheme (ETS) put forward by successive Governments”. Their shift to the right was mirrored by mainstream NGOs like Greenpeace, who now promote policies to “reduce emissions and give us new profitable markets for climate conscious global consumers”. Under the Greens’ new, business-friendly leadership headed by Russel Norman, any earlier misgivings have been replaced by a wholesale commitment to the market. This has allowed Labour and National to successively water down their climate policies until they became meaningless. Those of us in Aotearoa wanting to contribute to this global alternative face a long uphill battle. But shifting our government away from ineffective, market-based policies towards genuine policies to address climate change, and to prevent worsening climate disasters like the Australian bush fires, will require two things. Firstly, we have to have a new climate movement independent of the Green Party and mainstream NGOs. And secondly we’ll need left wing voices inside these groups which are much stronger than their current, muted state – or, more likely, a combination of both. They won’t stop until we’re all dead. I don’t like to click “Like” on a disaster, but I did want to show my concern. Thanks for summing this up Grant. Looking forward to a year of a growing grassroots movement. “They” can’t stop if their economic theory is based on perpetual growth.